A. 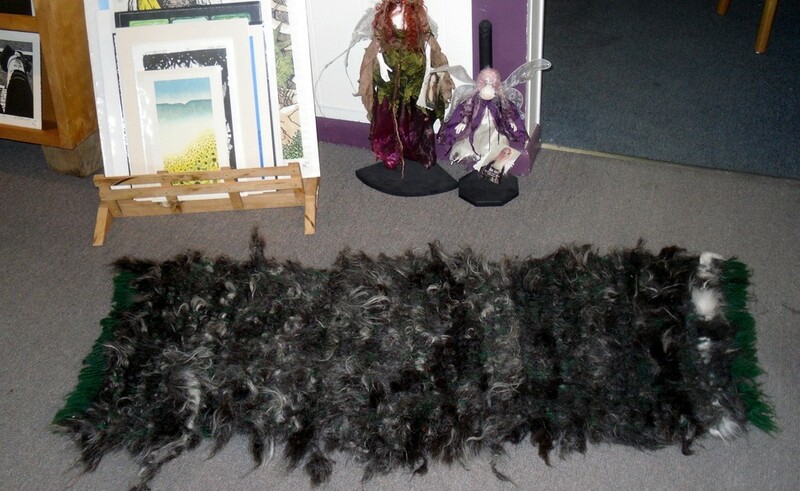 The name for the rugs that I weave and then felt from our critters fleeces happened about 2 o’clock one morning as we were prepping for a show. I had been standing and walking on the concrete floor of the workshop, when I walked on one of my rugs. “Wow, that’s like walking on a cloud,” were the words my tired brain said. Blending fleecy, fanciful, fluffy and many other wooly cloudy words, I suddenly said, “It’s Fleecyful!” And that’s what they’ve been every since. 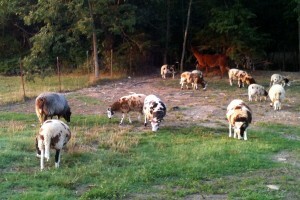 Laffing Horse Farm ewe flock guarded by Pequena llama. Q. 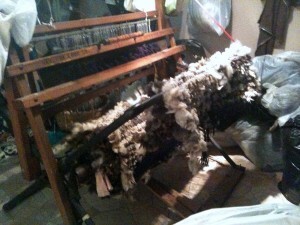 Where do you get the wool and mohair for your rugs? I weave my rugs on the 1929 Newcomb rug loom that my aunt Jeannie gave to me many years ago. It takes me 16 hours to warp this loom, and then about 2-4 hours per rug weaving time. I can weave 5-8 rugs per warp. Q. Do you shear your own sheep? A. Every year Lena and I shear all the sheep and goats, one at a time on a stand. As we use the hand shears, I get to know the fleece and when I put it in the pillow case for storage, I write on it the name of the sheep, the year, and the word “Spin, rug or if it is a particularly nice fleece it gets the designation “Me spin!” I figure for all the work I put in, I deserve the pleasure of spinning the best fleeces. 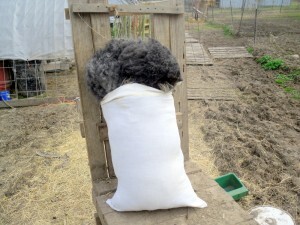 LHF Demi’s fleece more than fills a storage pillow case. Demi’s fleeces make some of my fastest selling rugs. Luckily, she grows so much wool, we shear her twice a year. Q. How do you weave your rugs? A. I weave the rugs either on my 1929 Newcomb rug loom or on my Ashford rigid heddle. I’ve been weaving rugs since about 1994. I developed my technique and my rugs through years of doing. I also credit Carol Lee’s Fleece Weaving; The Ashford Book of Rigid Heddle Weaving; Pam Dyer’s Locker Hooking Basics and a whole collection of books and magazines over the years. I learned that only wool warp will do what I want it to do on my rugs. I developed my method of weaving them will raw fleeces and then washing them to both clean them and felt them down into tight, durable, washable rugs. Q. 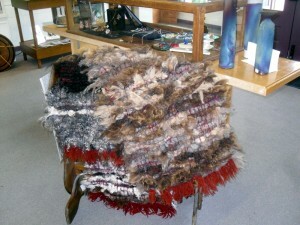 What does the felting process do to the rugs? A. Each rug shrinks 1/3 to 1/2 half of its original woven size in the washing and felting process. I’ve recently learned/decided that a front load washer is a vital part of my rugs working and looking the way I want them too, after spending a year without a front load and trying every other felting process known to wo-man, including dancing on the rugs in the driveway with soap and the hose! Q. How do you care for a Fleecyful Rug? A. Fleecyful Rugs can be washed on a regular basis in a front load washer on a gentle or permanent press cycle. Dry your rug over a porch rail, over the shower curtain rod or anywhere you hand your laundry to dry. Lisa is in the middle of inspecting this Fleecyful Rug and would prefer not to be disturbed. Q. Are these rugs safe for pets?